Everyone falls into a decorating rut now and then. 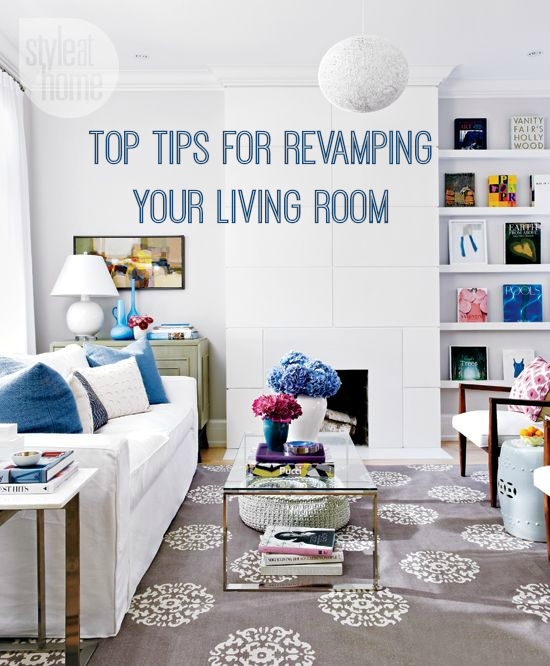 If your living room needs a new look, then it’s time to give it a makeover. Whether you’re looking to completely redo your space or give your living room a simple update, here are some ideas and tips to inspire you. Plan the right furniture, layout, design theme and accessories to make your living room a place that you really enjoy. A fresh lick of paint has the power to transform a room entirely. Choose a colour scheme and buy some paint for the walls. Take the accent from elsewhere in the room, such as the curtains, avoiding colours that already dominate – blue sofas and blue walls are not a good combination! For a budget update, use the decorator’s best friend – new toss pillows – in a shade to match for subtle colour coordination. Paint anything and everything, not just the walls. A fresh coat of paint goes a long way towards creating a new look in any space. Reinvent a piece of furniture by changing the colour, or give a tired, dark brick fireplace second life by painting it creamy white. A graphic rug is a simple way to make a big statement. For a unique twist, try some FLOR carpet tiles to create one of a kind, eco-friendly area rugs, runners and wall-to-wall designs. Mix and match styles to create carpets to fit any space. They’re available in a wide variety of patterns and are a quick and easy way to create a customised rug on a budget. To update your home without spending a penny, simply rearrange the furniture you have. Experiment with the room’s layout, thinking about how you can have a comfortable conversation with someone sitting on another piece of furniture. You want to create an intimate seating area. Why not try pulling the sofa away from the wall? Use colourful artwork or photography to personalise your space and create a focal point for the room. Enlarge your own photos or choose from thousands of prints on affordable sites such as Canvas Republic. Lighting is chiefly responsible for setting the mood, so you need to get it right. Living rooms are the centre of your home – the place where you spend quality time with family and entertain guests – so you want lighting which is conducive to relaxation and enjoyment. Get the lighting right and you will perfectly capture the blend of intimacy and entertainment you want. Use a pair of matching metallic table or floor lamps to add some sparkle and drama whilst avoiding the harsh glare of a light bulb. Soften your living space with ready-made drapery panels and transform your lounge from bland to beautiful. If a standard-sized window panel doesn’t fit, it’s time for some DIY home improvement: buy the next size up, and hem the panel so that the drape hangs half an inch to an inch from the floor when hung. Your sofa is the centrepiece of your living room. Think about your theme: do you want something traditional, classic, modern, designer or contemporary? You don’t even have to leave your home as you can look at one of Shackleton’s handmade sofas online to help you find a unique statement piece for your home. Use our DIY tricks and stylish solutions to make some easy upgrades that will give your home a brand new look.